It's raining again. The plants that already live in my garden are loving it and growing like weeds. The weeds are growing too, unfortunately. If I remember right, last spring started out like this, and we marveled over how lush and green the gardens were, until summer hit and the rain stopped. Such is a gardener's life. 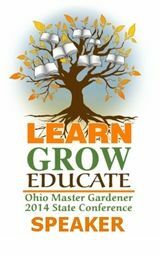 So when it's too wet to plant or get the gardens ready to plant, what's a gardener to do? 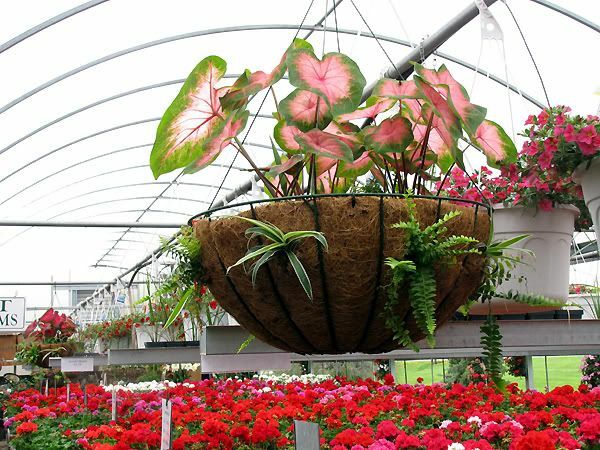 Go plant shopping, of course! 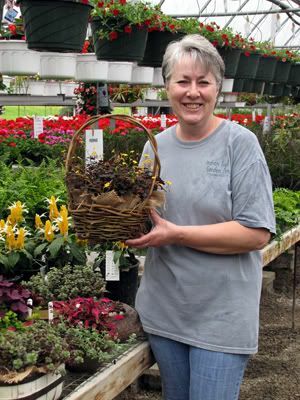 Mom called me late last night and said if I wanted to be at her house at 8:00, she was going to Indian Trail Garden Center in Columbus Grove, and I could go along. Well, I hadn't been feeling well all day and didn't relish the idea of having to get up early enough to catch the ride, but never let it be said that I passed up an opportunity to shop for plants! 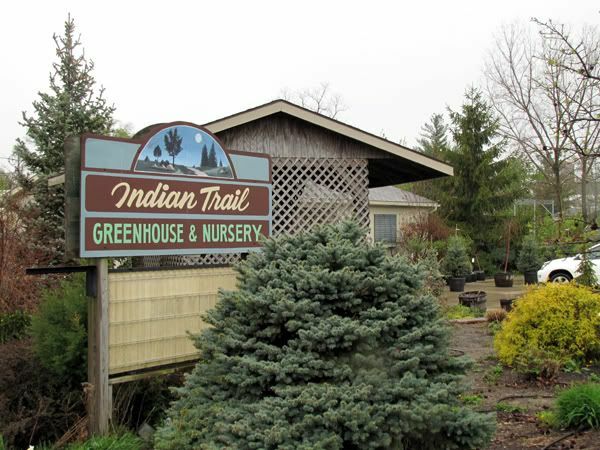 Nestled in a small town in Northwest Ohio, near the banks of Plum Creek, lies Indian Trail Garden Center. It's about an hour or so from my house and not really on the way to anywhere else I go, so when I get the chance to visit, I take it. This time, I didn't really expect to purchase much, but we all know how that goes. 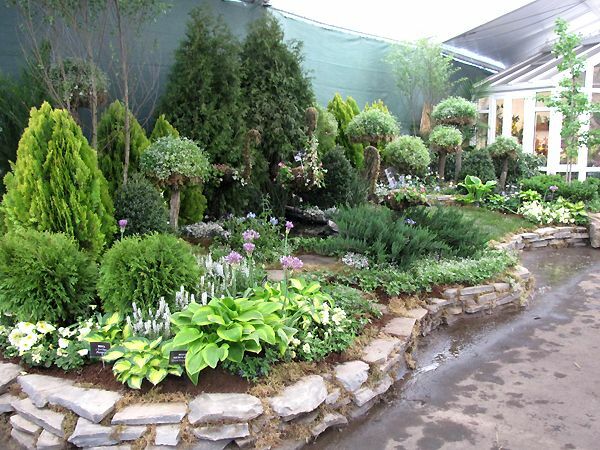 And the fact that they had some of the finest looking plants I've seen all year at great prices played to my weakness. 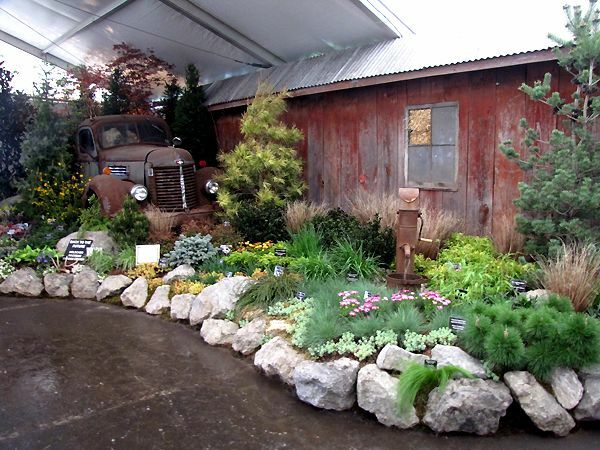 Our Little Acre is going to be on the Master Gardeners' Garden Tour this year and though I won't be doing much of anything differently than I do any other year, when buying plants this spring I do have the tour in the back of my mind. In other words, I'm trying to pay more attention to color and form and texture and all those design elements that my mind doesn't take to naturally. 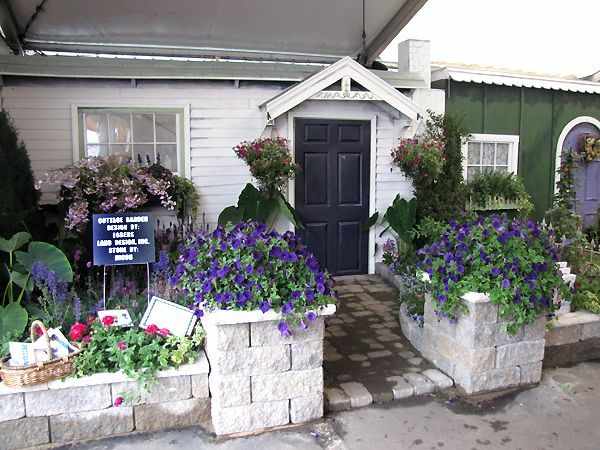 My usual mode of operation is to stroll through the garden centers and if I see something I like, it pops into my cart. I worry about where I'm going to put it when I get home. Today was no different and heaven help me, there were so many wonderful things that I overshot my budget. Wait . . . I don't have a budget. That might be the first thing that gets me in trouble, but really, who could resist such hot stuff like this? One of the highlights of my visit was getting to meet one of my readers! 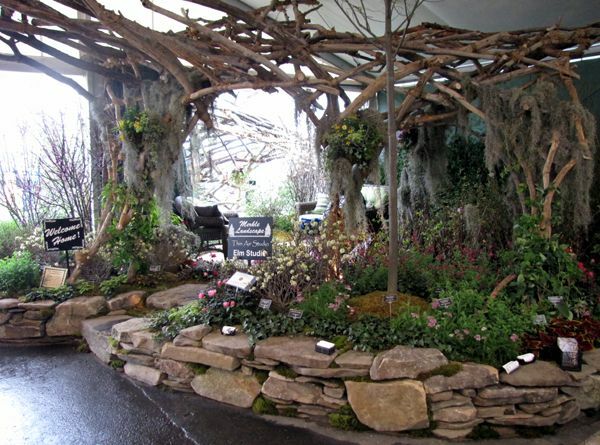 Mom had been there the week before and was talking with one of the employees about being at the Cincinnati Flower Show. The employee mentioned that a blog she follows had posted pictures from the show and it only took a few minutes for Mom to realize it was my blog she was talking about! 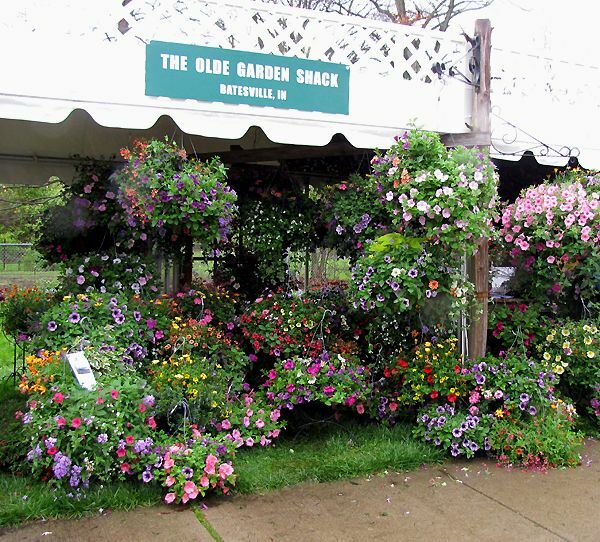 Kathy and I had a great time talking flowers and plants and gardening and I look forward to seeing her again when she attends the garden tour. I ended up getting most of what I'll need for my window boxes and container plantings, so even though I spent more than I expected, it was all necessary! Really! And I found a really nice large pot of 'Crimson Red' rhubarb that I bought to grow for Romie. He likes it. I don't. See? It isn't all about me after all! When I come across a business that does something exceptional, it grabs my attention. And I remember places like that. It could be what they're selling, their prices, or the service I get when I shop there. 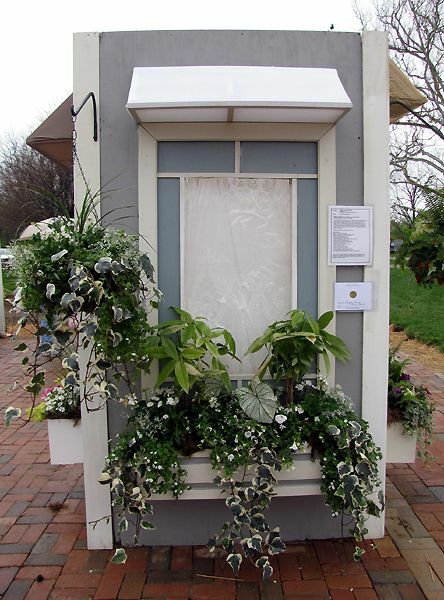 Last week, while Mom, Kara and I were attending the Cincinnati Flower Show, we came upon a simple, small booth with a smiling, petite woman standing behind a table. On that table, lined up like soldiers, were small black bags, each with a photo attached of a single bloom of a gorgeous peony. 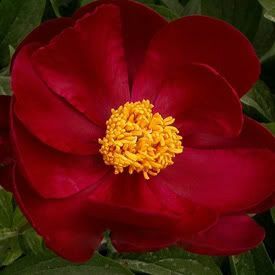 Now even though peonies are one of the first flowers I can remember from my childhood, and I live near what was once known as The Peony Capitol of the World, they were never on my list of "oh I must have that" plants. And then I attended the Cleveland Flower Show in 2005, was smitten by a tree peony ('Sahohime'), and suddenly nothing was the same as far as peonies were concerned. There are herbaceous peonies (including the fernleaf), tree peonies, and intersectional peonies. There are also such things as Japanese woodland peonies (a type of herbaceous) which might be considered a 'species' peony, something I just discovered this week. 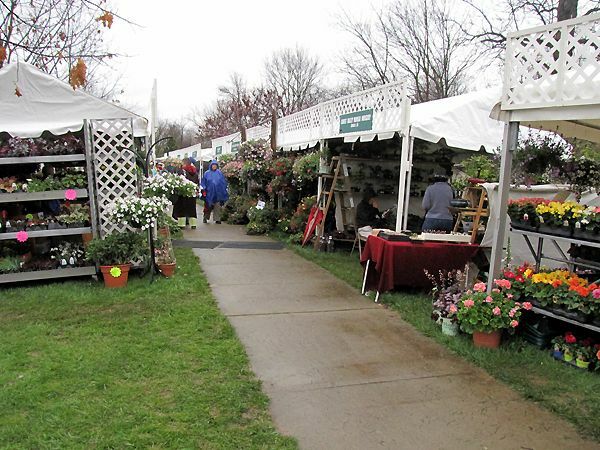 Peony's Envy, a grower in New Jersey that specializes in peonies, was the vendor we encountered at the Cincinnati show. 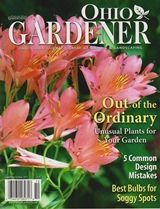 We spent some time talking with Kathleen Gagan, the owner, and came away with some valuable information about growing peonies. We also each walked away with a little black bag. Mom got a tree peony for the Smiley Park Children's Garden, Kara got an herbaceous peony, and I got an herbaceous single ('Moonlit Purple Lotus'). 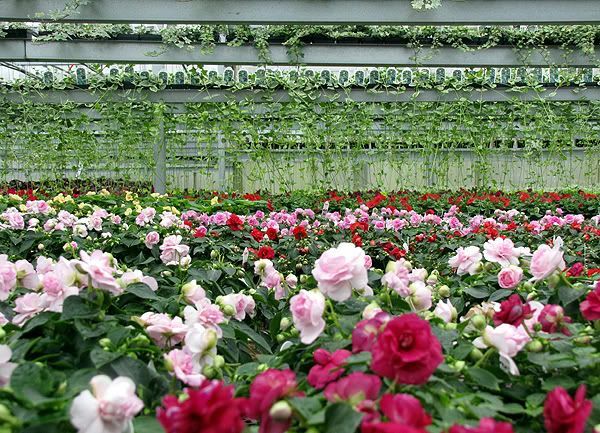 Peony's Envy is the second largest peony retailer in the U.S. and we know why. When you have an excellent product and provide service with a smile, that's what happens. 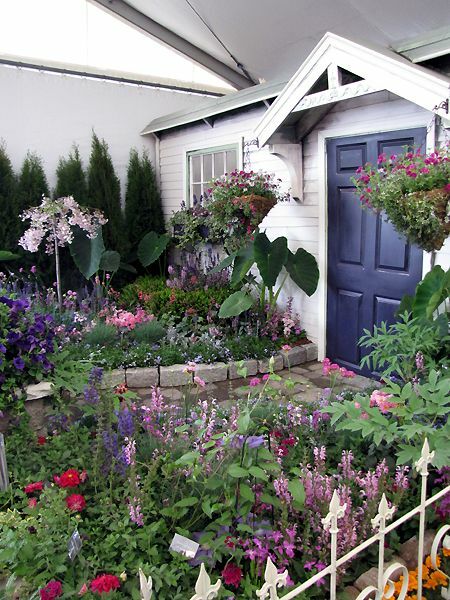 From May 1 through June 15, you can visit their display gardens and nursery near Bernardsville, New Jersey. You can also order online from their website. 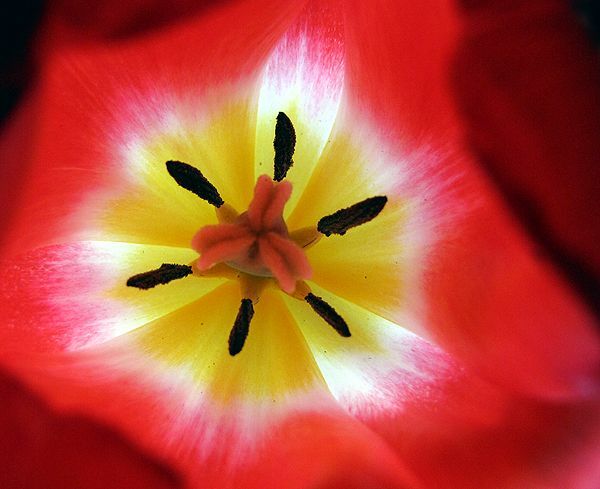 I always say I'm not wild about tulips, and then spring comes and one of the things I love seeing the most is tulips. So last fall, I decided to plant some more of them. Am I glad I did that? With so many of them in bloom right now here at Our Little Acre, you bet I am! When I planted 'Princess Irene' last fall, I expected a more pink tulip than they have turned out being. They're actually orange with a violet streak on the outside of each petal. While still pretty, I'm still searching for the hot pink/magenta one with those same streaks. Kara has them in her garden, but she doesn't know their name. 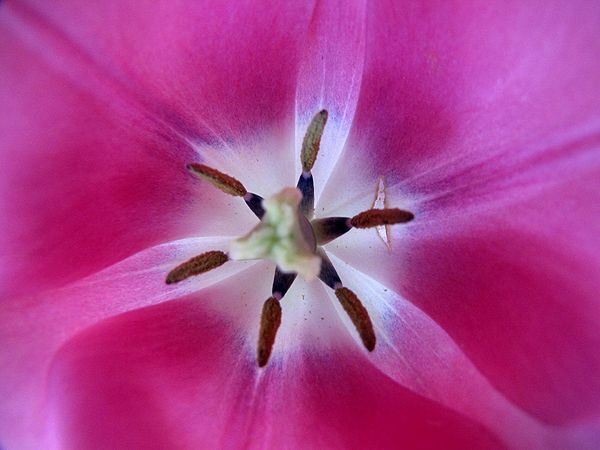 One of my favorite things to do when the tulips are blooming is to photograph their centers by sticking the nose of my camera right down in them. What works of art they are! Last Saturday, we went to younger daughter Jenna's house to help her with some landscaping and planting. I walked in the front door and she said, "Mom, come around back and see these amazing pink flowers that came up. I don't know what they are, but they're so pretty." As I rounded the corner and saw the row of flowers blooming, my eyes lit up and I said, "SPECIES TULIPS! You've got SPECIES TULIPS!!" Jenna wasn't too impressed, but I sure was. And darling daughter that she is, she didn't object when I asked if I could have some to take home. Bulbs included. She must really love me. 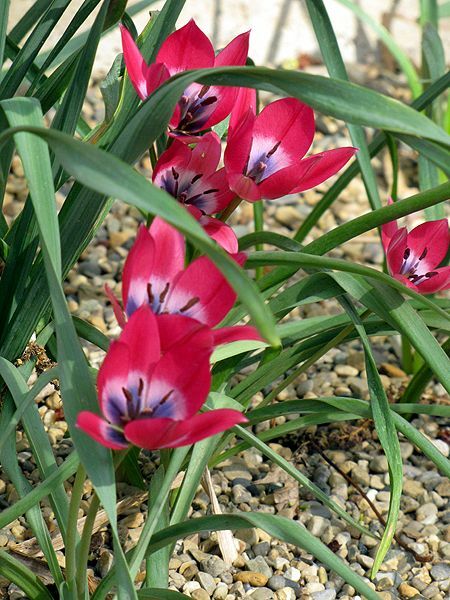 Species tulips are smaller, shorter, have narrower foliage and are likely to naturalize. 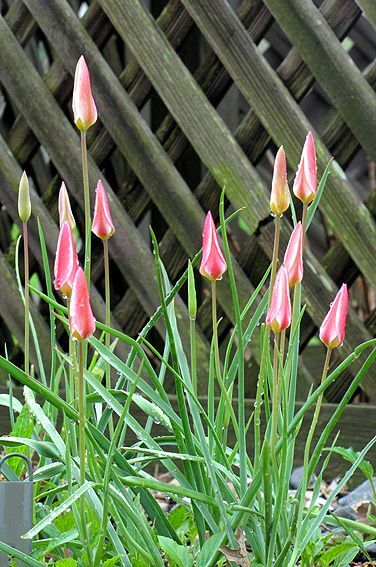 I've had 'Lady Jane' species tulips for several years and love their delicate lily-like blooms. I've moved those twice, but they have enjoyed their present home in the Japanese Garden for several years now and have indeed multiplied. They are not natives of The Netherlands like their hybrid progeny. 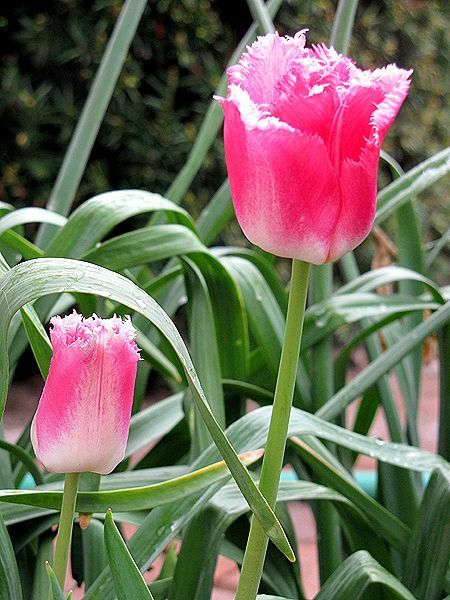 Found in the highlands of eastern Europe, they are also called botanical tulips. 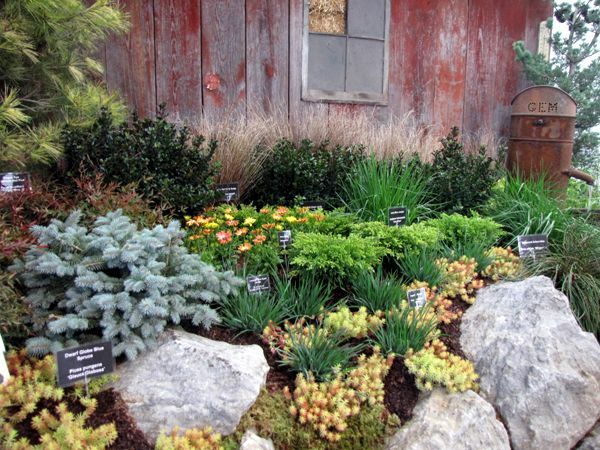 They like rock garden-like conditions with lots of sun and excellent drainage. 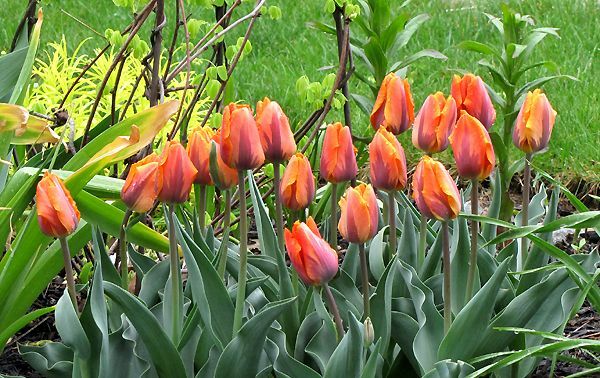 There are a few other tulips yet to bloom here (once it quits raining and the sun comes out), and there are others that I want to procure this fall for planting in the gardens. 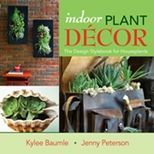 A favorite book of mine is Tulips: For North American Gardens by Brent and Becky Heath. 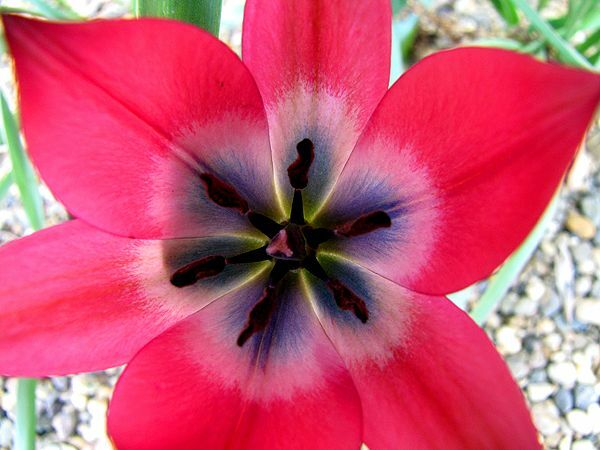 Brent and Becky's Bulbs is an excellent source for tulips, as is John Scheepers. This past week had people giddy in our part of the country over the unusually warm temperatures. 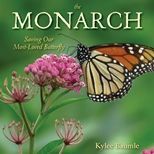 Not only does it energize us after a winter of ice storms, deep snow, and frigid cold, it seems to have the same effect on other living things. 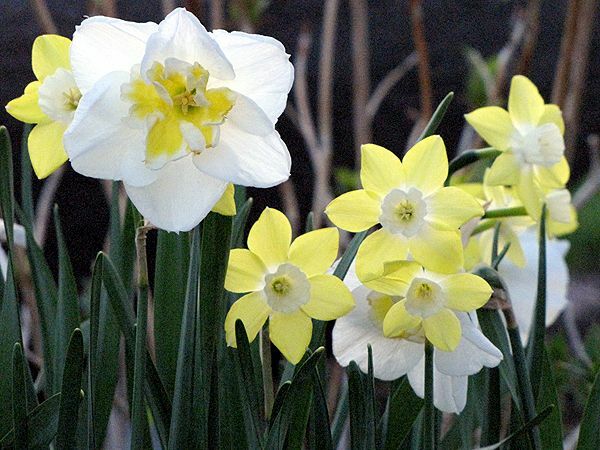 Never before have my daffodils all burst out in bloom at the same time. 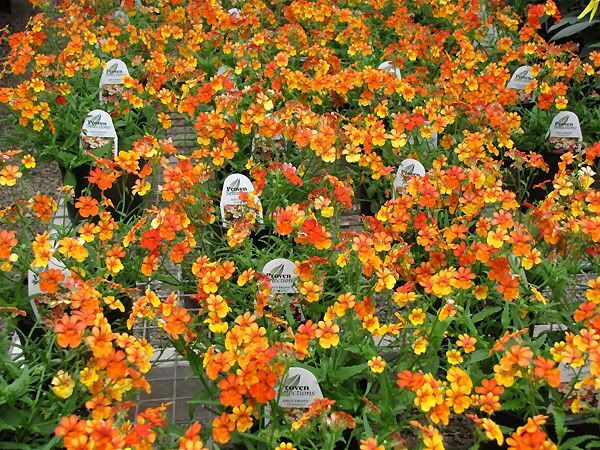 I have early, middle, and late season varieties, but all except 'New Baby' are in full bloom now. That's what daily highs in the 80s will do. I put my Oriole feeder out last weekend, because I knew it was coming up on time that they should be passing through here, and yesterday I saw one scoping it out from a nearby tree! And if that wasn't thrilling enough, I also saw a Rose-breasted Grosbeak doing the same thing near the seed feeders. Last year, they bypassed us altogether. Neither of them will spend the entire summer here. The orioles will nest, raise their young, and move on. 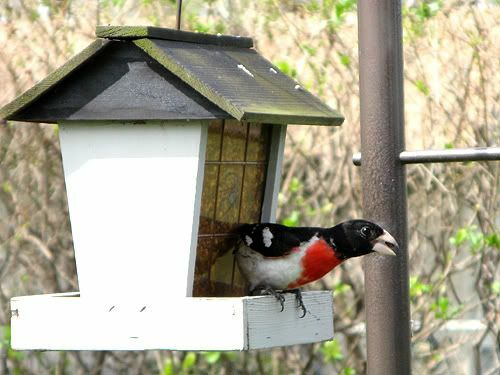 The grosbeaks will stay even shorter. But however long we have them, it's thrilling to see the friendly grosbeaks and hear the brilliant song of the oriole as we relax on our patio or work in the gardens. This evening, as I was talking to our neighbor on the patio, a little flash of blue zipped past us. We saw it in the tree, about the size of a wren and in full dress blues. An Indigo Bunting! I guess Our Little Acre is where it's at in the bird world this week! 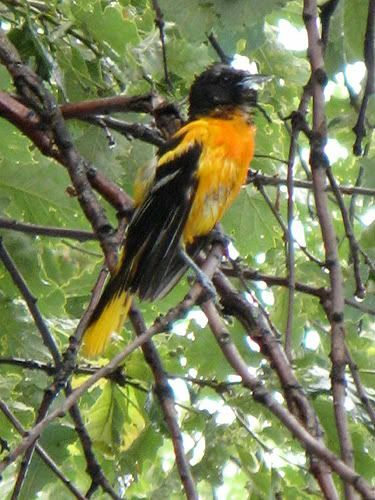 Photos of Oriole and Grosbeak are from 2007. 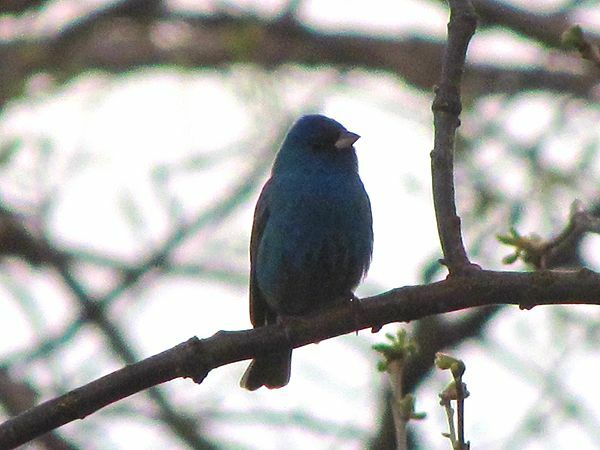 Indigo Bunting photo taken this evening. 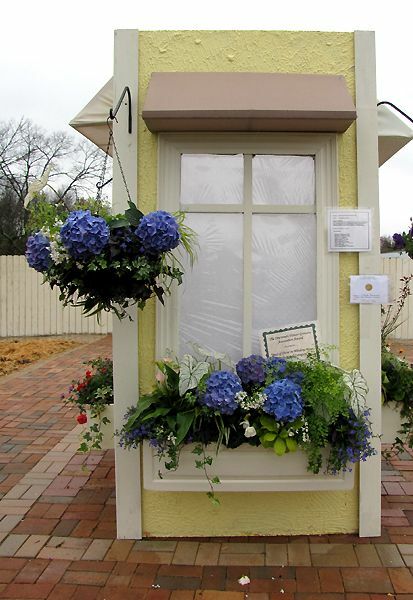 One of my favorite parts of the Cincinnati Flower Show each year is the Window Box Showcase. 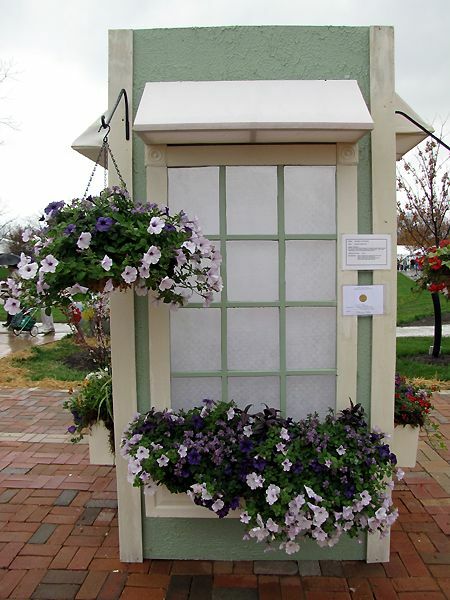 Stations of four-square window boxes are planted with one hanging basket and one window box. 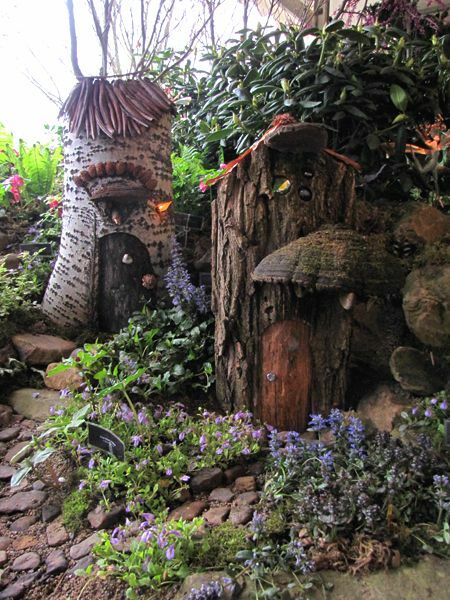 Various themes can be found, as well as some that are just plain pretty. Peppered throughout the grounds were these large painted pots. 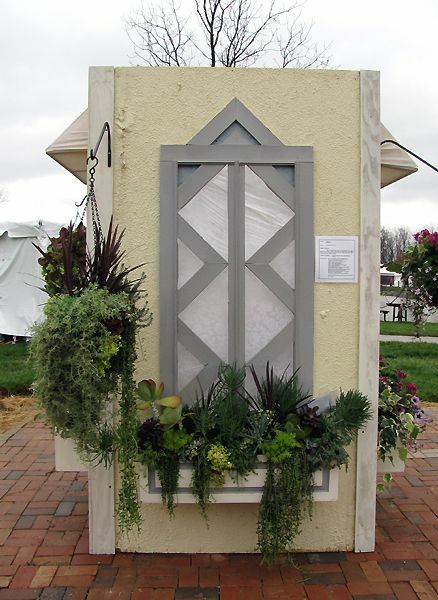 This one by the windowboxes shows the Cincinnati skyline in the background. 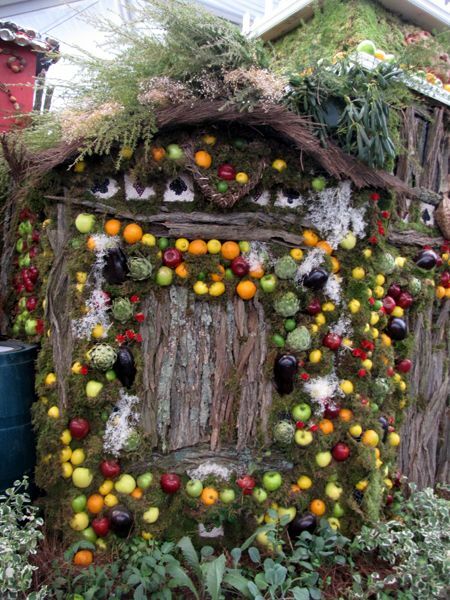 Everything in this display is edible! The orange and yellow flowers in this display are collarette dahlias; the purple is trailing verbena. 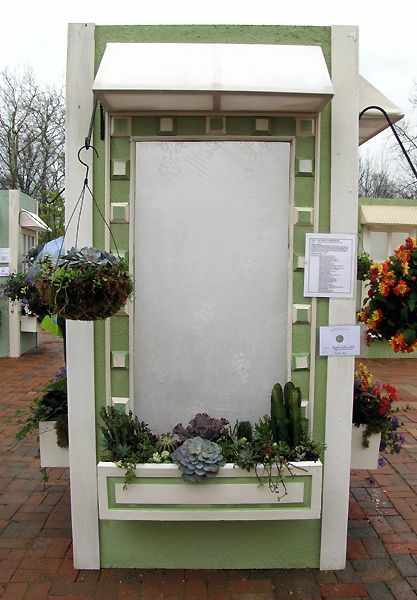 Perhaps not showy from a distance, this display using succulents was one of my favorites. So much beautiful texture in this one! 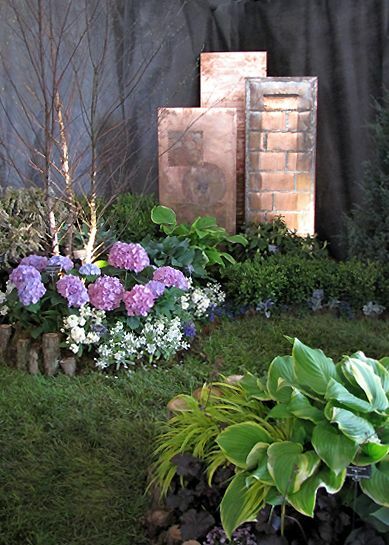 Another of my favorites was this display using those electric blues of hydrangea and lobelia with some lime green thrown in. 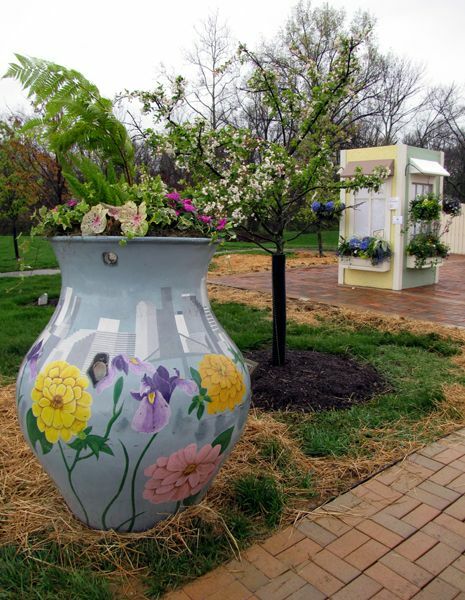 In the U.S., Arbor Day is traditionally celebrated on the last Friday of April. Many will plant a tree on this day, but I want to call attention to a new publication about trees that may help you, whether you're planting one or trying to identify one. So we're walking through the woods again, and there's this awesome tree off to the right. It's got the loveliest white clusters of blooms and we see them every spring. We always wonder what they are and vow to get a tree guide that we can take along on our hikes so we can figure it out, but we never do. So when What Tree Is That? 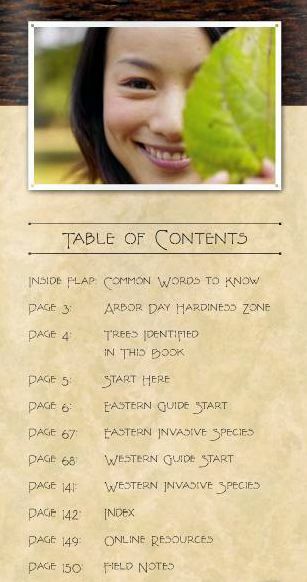 - A Guide to the More Common Trees Found in North America arrived in the mail the other day, I let out a "Woo-hoooo!" 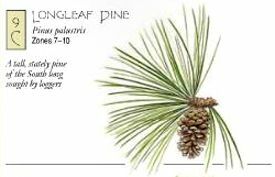 The Arbor Day Foundation puts out this fabulous publication and I have them to thank for helping us identify the tree in question, as well as providing plenty of excellent illustrations and information to allow us to identify plenty more. This is the complete North American edition and is well-priced at $14.95. There are many tree guides out there, but the reason I especially like this one is its size (8.5 x 4 x 0.3 inches, 164 pages) and ease of use. It also has a list of online resources and a Field Notes section at the back, for recording your own observations. Just an aesthetic item of note - they've used a favorite font of mine for the titles and headings - 'Terracotta' by Frank Lloyd Wright. 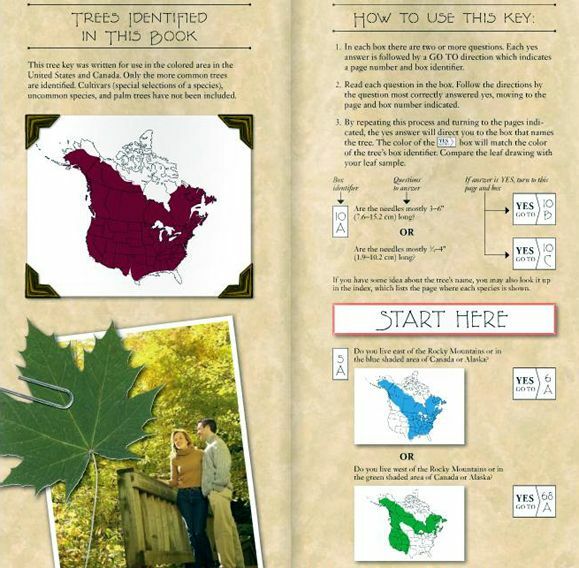 By no means should this be considered the be-all and end-all of tree identification sources, but it does include the commonly-found trees in the U.S. (and much of Canada). To be any more complete wouldn't allow for the portability that What Tree Is That? has. If I could change anything about it, it might be to make it spiral inside the outer cover. But now we're nit-picking and that wouldn't be fair to such a fine publication put out by our friends at the Arbor Day Foundation. 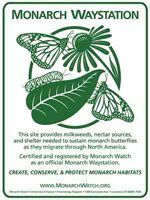 Pamphlets are also available for the Eastern and Western U.S. for $4.95 each from the Arbor Day Foundation. 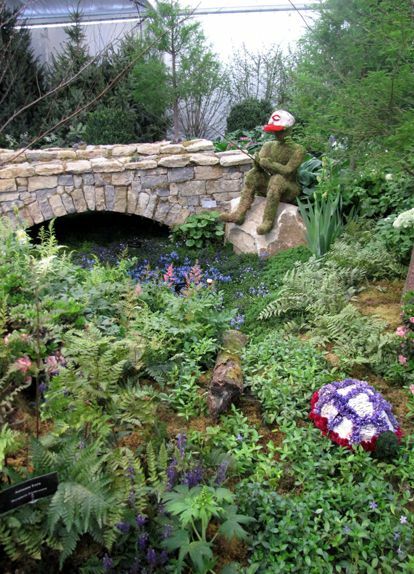 Since I took over 200 photos of the Flower Show, it has taken me quite a bit of time to wade through them to find the best views and get them resized. I'll be sharing them with you in parts so that one post isn't so graphic intensive. I know dial-up readers will have a hard enough time waiting for them to load the way it is. "Prepare to be Astonished!" they said. 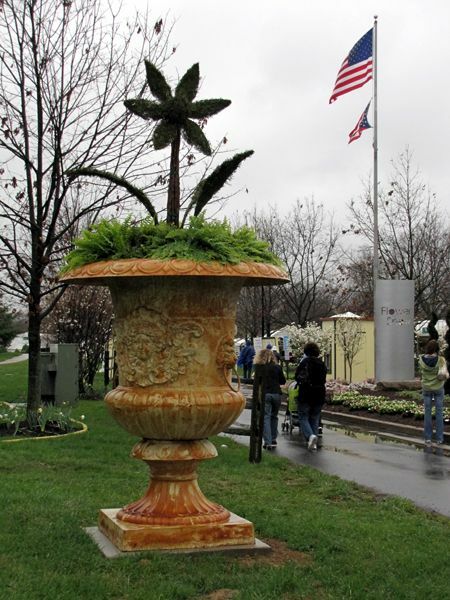 In many ways I was, but the nasty weather we experienced as we attended the 2009 Cincinnati Flower Show on Monday literally put a damper on things. The only thing that could have made the weather worse for walking around outside would have been snow and I was beginning to wonder if we wouldn't see that. We could see our breath and I was so cold I actually bought a hot chocolate to drink to warm me up. I don't even like hot chocolate. 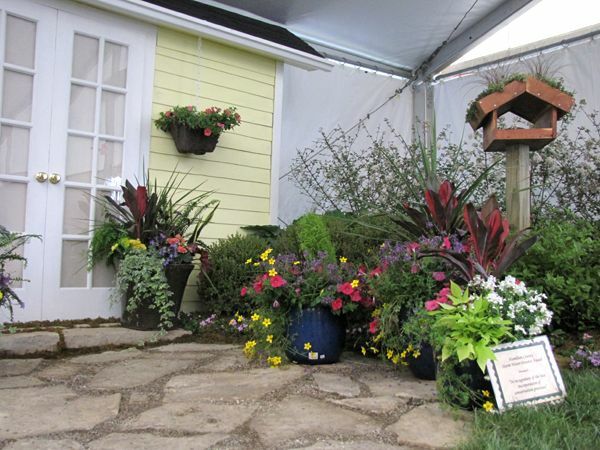 The show was at a new location this year. 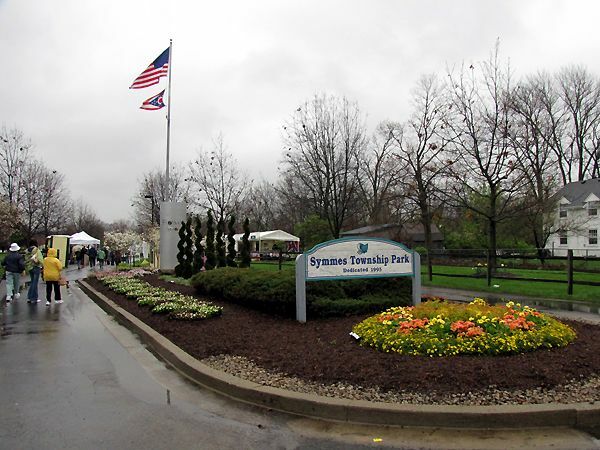 They moved it from Coney Island, which was very picturesque, to Symmes Township Park. In time, I think they will adapt things better to this location, which I have read is to be its permanent home. With the economy the way it is, I would imagine this was not the best timing to prepare a new location for such a large show. Coney Island had some permanent buildings that housed some of the displays, whereas everything in Symmes Township Park was under large tents. Wind and tents just don't get along very well. And there was literally no place to go to really get away from the weather. People (us included) were going into the restrooms and warming themselves by using the hand dryers. Several vendors were seen closing up early, because it wasn't very pleasant for them either and the weather kept the crowds away. Yet we tried not to let the weather keep us from enjoying the show. Let's look at the show itself now. The first thing we noticed when the shuttle dropped us off were the large urns on each side of the entrance. VERY LARGE and attractive, even though they held no colorful blooms. 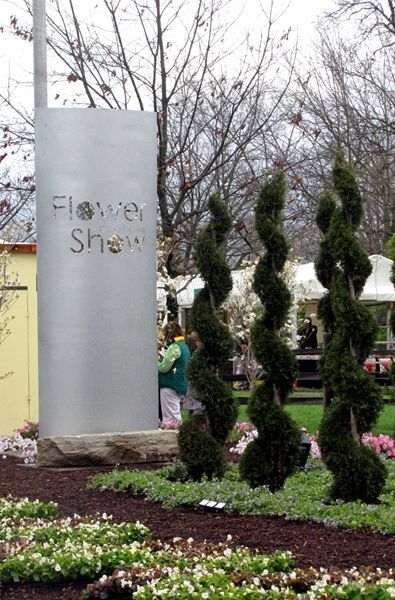 It looks like they took the original steel "Cincinnati Flower Show" sign from the Coney Island location and placed it at the entrance here, except it seems smaller. Once through the entrance, Vendor's Row began immediately and we were tantalized by the wonderful and colorful offerings, as we knew we would be. Healthy bulbs from The Netherlands (yes, the vendor traveled all the way from there - we asked) were a dollar apiece for oriental lilies. I can't believe I left there without a single one! 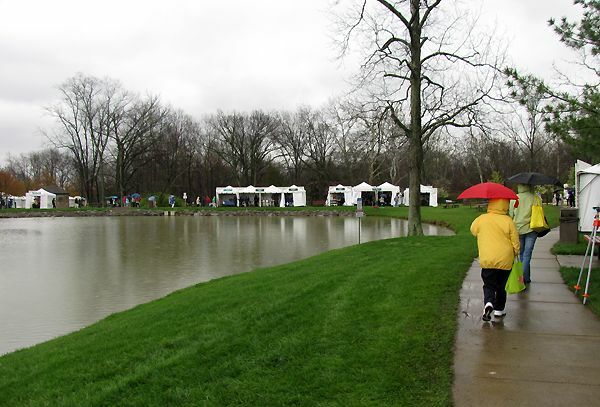 We zigzagged our way through the length of this first group of vendors and remarked how on a warmer day, it would be difficult to make our way through the narrow path. No problem on this rainy day though! Our problem was trying not to poke people's eyes out with our umbrellas. One advantage to less people shopping is that we got to visit with the vendors more than usual. 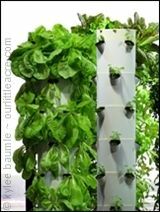 Instructions on planting, tips on growing, and just friendly chit-chat was possible and served to make our day more enjoyable. 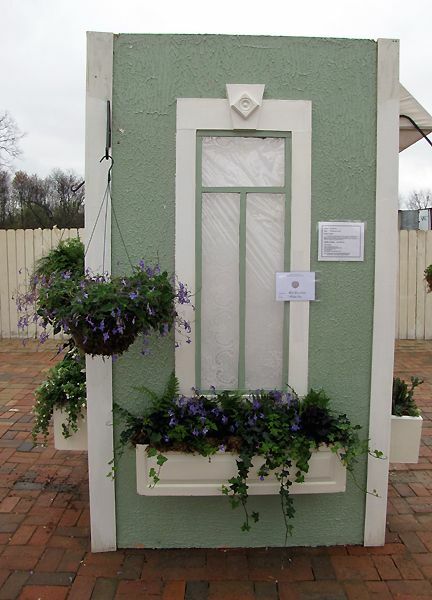 It's always fun to see what unusual vendors are there that are remotely garden-related. One of the new ones this year was Brite-Spots. 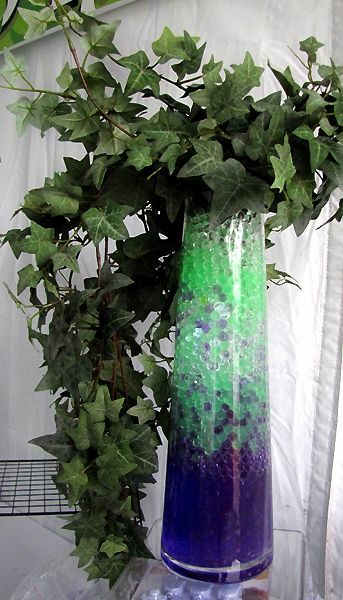 They're little polymer beads the size of Minute Tapioca that swell when you add water and you can use them for cut flowers in vases as well as for growing some types of plants (think bamboo). 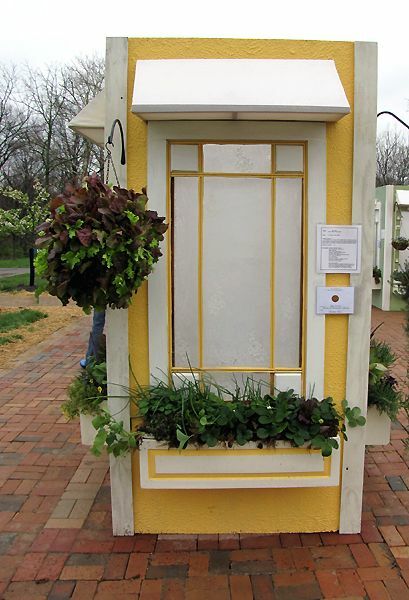 One of our favorite stops along the way was Peony's Envy, new to the show this year. 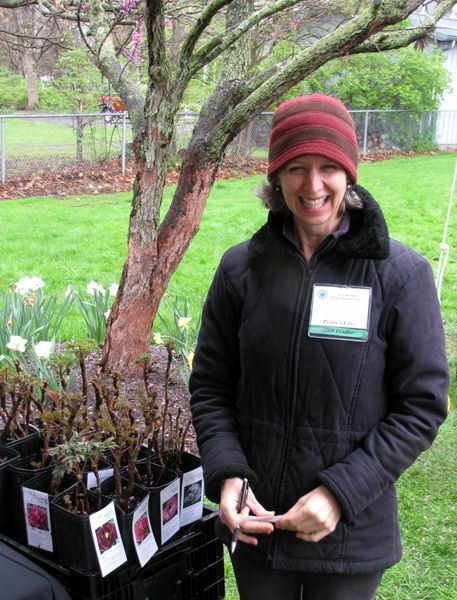 We spoke with owner Kathleen Gagan at length and learned so much about growing peonies. She was charming and there will be a separate blog post about her business in the coming days, because she deserves more attention than merely a mention in this post. Until then, you can visit her at Peony's Envy. 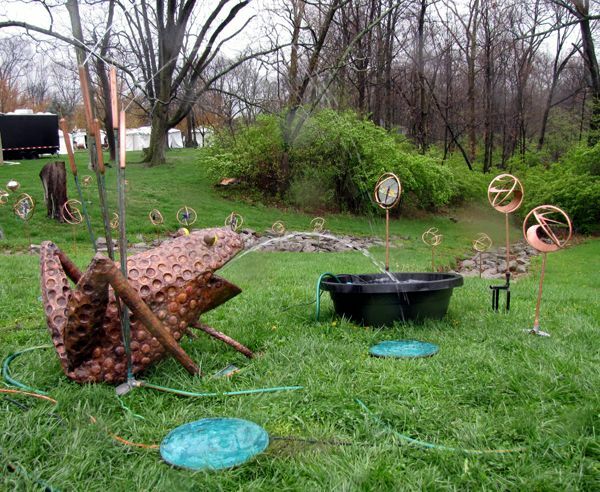 This frog fountain would look pretty good in a large pond or lake setting. 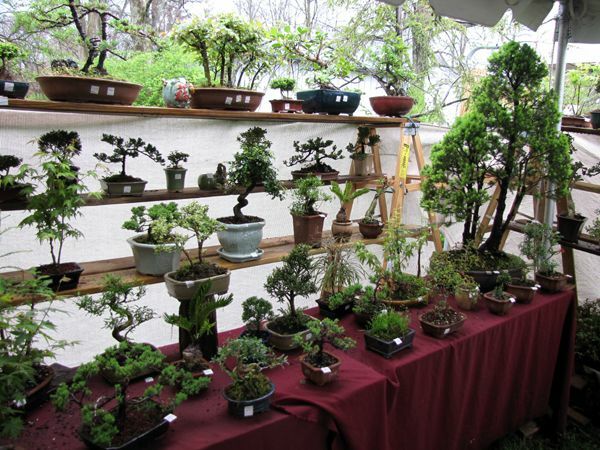 There were some pretty amazing bonsais and we got some great tips on growing them from this vendor. 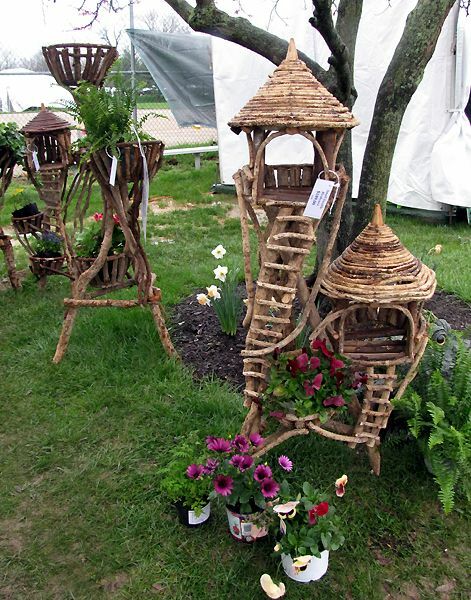 These willow birdhouses were nice and the birds liked them, too. We watched a robin trying to make a nest in one. The vendor said the robin had been working on it for a couple of days, but they kept it cleaned out, so that whomever might want to purchase it didn't have to take away someone's home in the process! 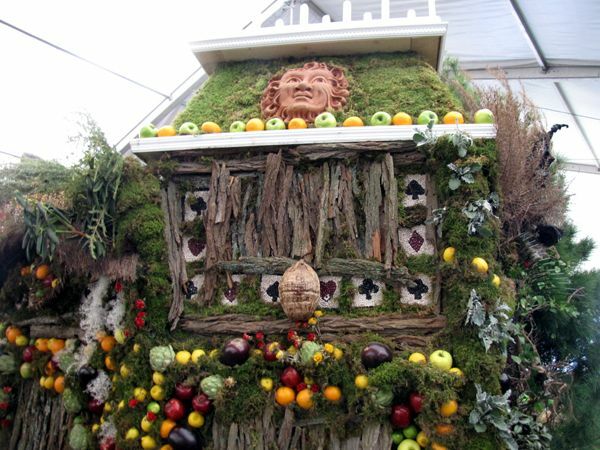 In the Grand Marquee, landscape gardens and displays were housed in three tents and these were indeed impressive. There were far fewer outdoor rooms featured as in the past, a welcome change, as far as I'm concerned. 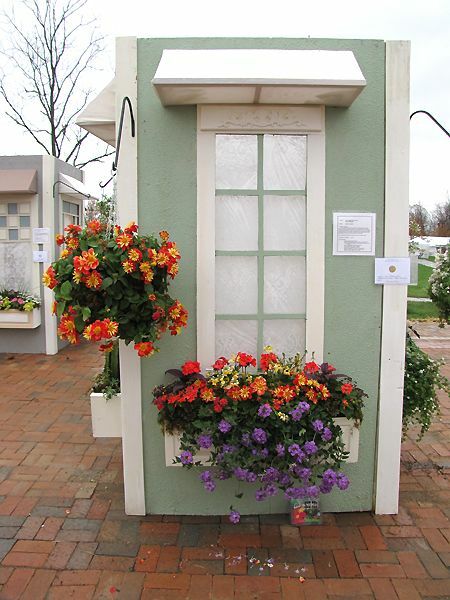 Several of the displays were done in a manner that can easily be duplicated in gardens both large and small. 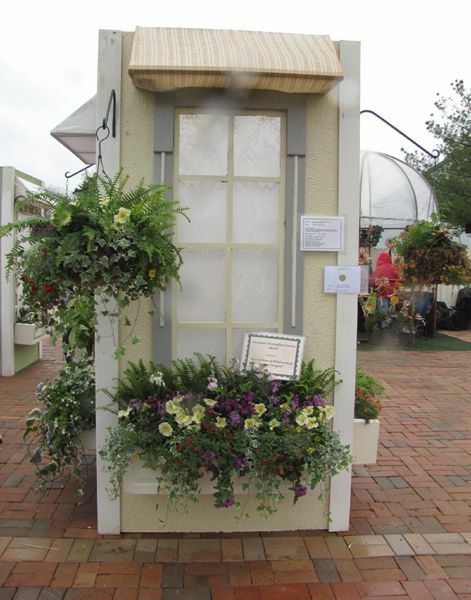 By far, the display that garnered the most buzz at the show was the...hmmm...what to call it... 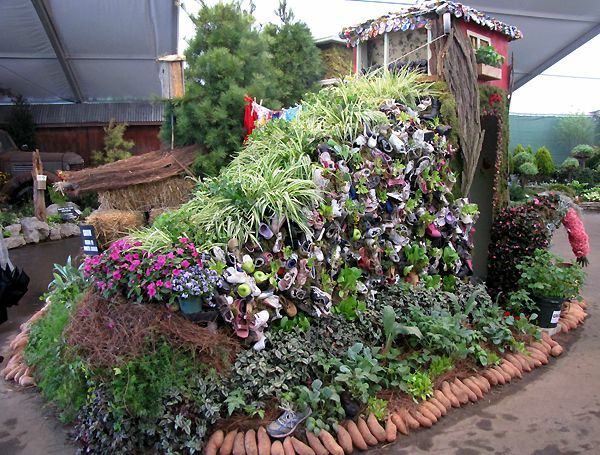 There were nursery rhymes represented within its confines, but the one that was the main focus was "There was an old woman who lived in a shoe..." There just aren't enough adjectives in the English language to describe the creativity and ingenuity it took to create this thing. 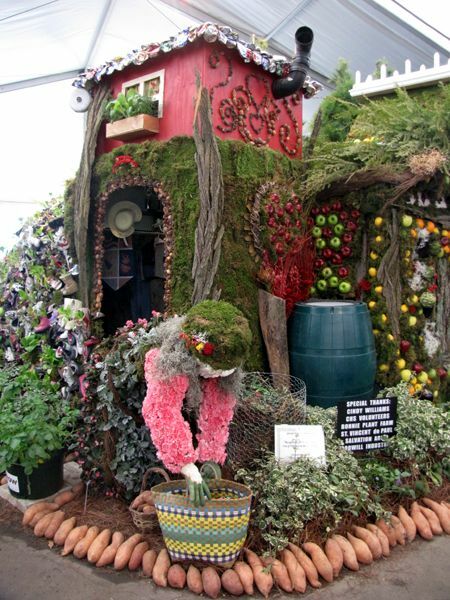 Click on each photo to enlarge it so you can see the detail in this display! 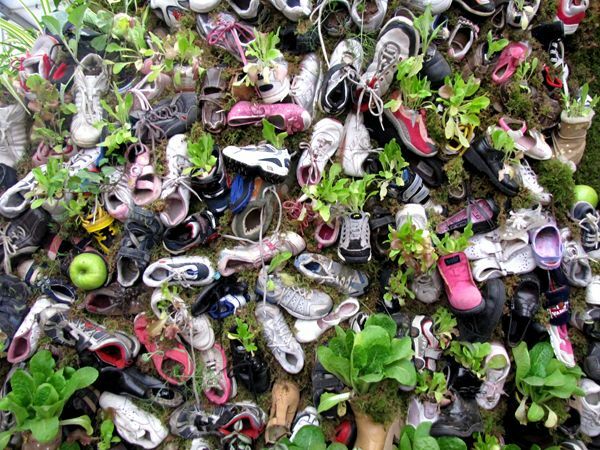 Yes, the shoes are planted with lettuce. 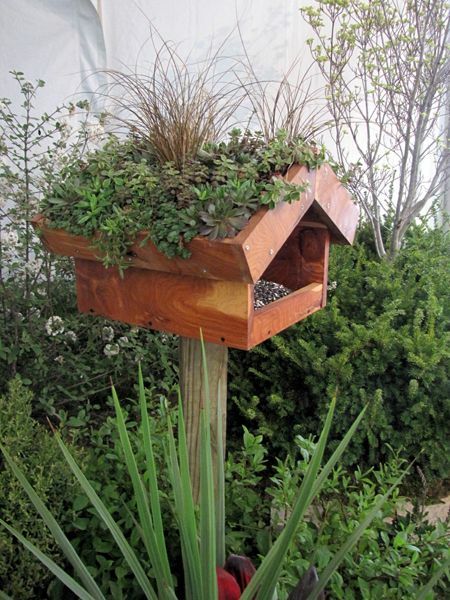 The roof of the bird feeder was planted with live plants. 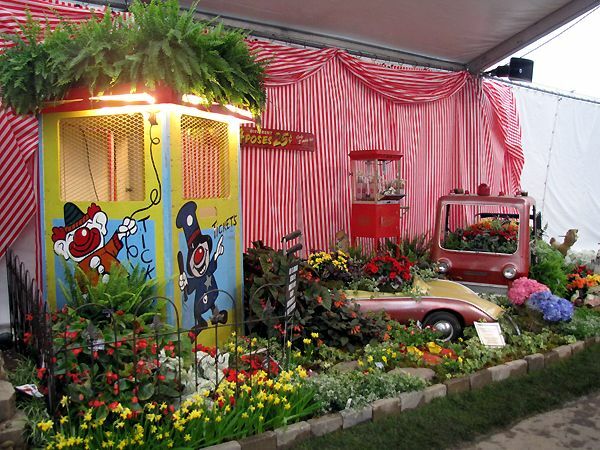 There are always a few displays that are full of whimsy. I really liked the Asian influence in this one, which also has a bit of Frank Lloyd Wright look to it. 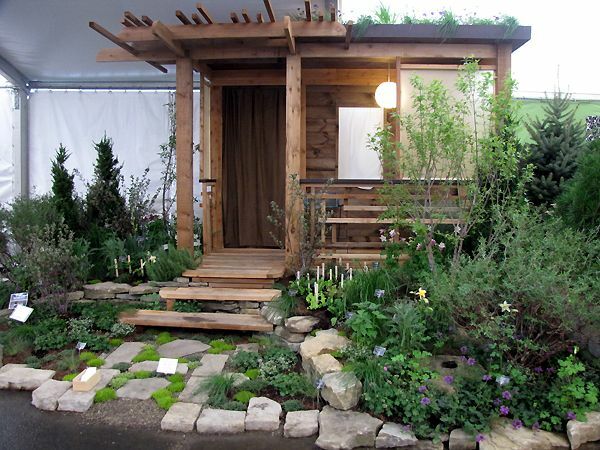 And take a look at this backyard retreat. Pergola?? 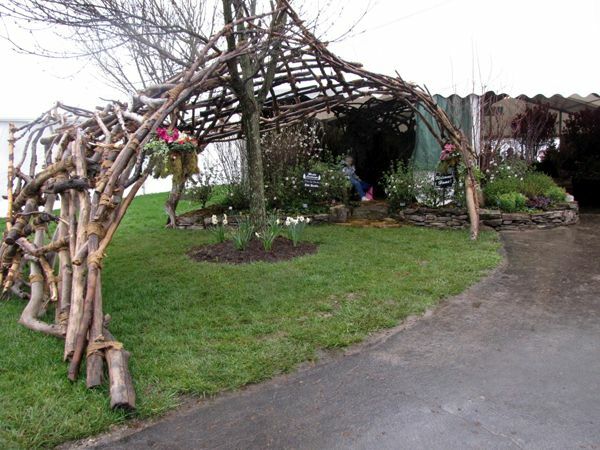 Half was inside the tent and the other half was outside and built to include the existing tree. 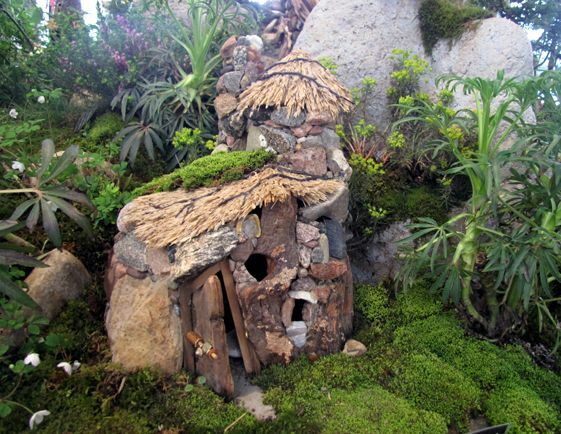 One of the most beautiful fairy gardens I've ever seen was actually a "village" that could be viewed 360° and made extensive use of logs and succulents. Yet to come: The window boxes, exotic table settings, and vignettes on a theme.